The owner of Currys and PC World, DSG International, has issued a profit warning after poor Christmas trading. Shares in the firm plunged more than 27% after DSG said full-year profits could be up to £50m below expectations. Like-for-like sales, which do not count new shops, fell 1% in the 11 weeks to 29 December. Computer-based sales fell 11%, while electrical goods dipped 1%. Many analysts predicted High Street sales would suffer this Christmas as consumers reined in spending. DSG said it had seen lower demand for laptops, and profit margins had been hit after it cut prices to drive sales of flat panel televisions and other electrical goods. The one plus point for the group came from its online businesses, with total sales at Dixons.co.uk and FotoVista up 31%. The company said the sales performance reflected the "generally weaker consumer environments across many of our markets". "Overall trading for this important period, in which over half our annual profits are usually generated, has been disappointing, particularly in the UK, Italy and Spain," the retailer added. Before the latest update, analysts had been expecting DSG to report annual profits of £300m-£320m for the year to end April. Shares in DSG closed down 29.25 pence or 27.3% at 78.0p in London. "Concerns for the health of the consumer going into 2008 have today being underlined," said Keith Bowman, equity analyst at Hargreaves Lansdown Stockbrokers. "Profit margins remain pressured via a combination of increased promotional activity and consumers' growing addiction to sale prices." There were further signs of the growing nervousness on the High Street from fashion retailer Next on Thursday. Next said it remained "extremely cautious" about prospects for 2008, noting that many consumers were set to see their finances squeezed this year when fixed-rate mortgage deals expired. However, Mr Bowman added that some of the problems at DSG may be company specific. "The evident consumer trend to purchase electrical goods online leaves the group's store based strategy looking vulnerable and whilst management have developed an internet outlet - the one major bright spot across the group - the speed of development is questionable," he said. However, DSG said that it had no plans to close stores. 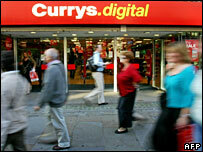 Its comments came after an analyst note said the firm might shut 200 of its 700 Currys and PC World shops. "The stores are core to our business. We think stores will be core to retail for some time to come and we have no plans to close stores at the moment," said finance director Kevin O'Byrne.